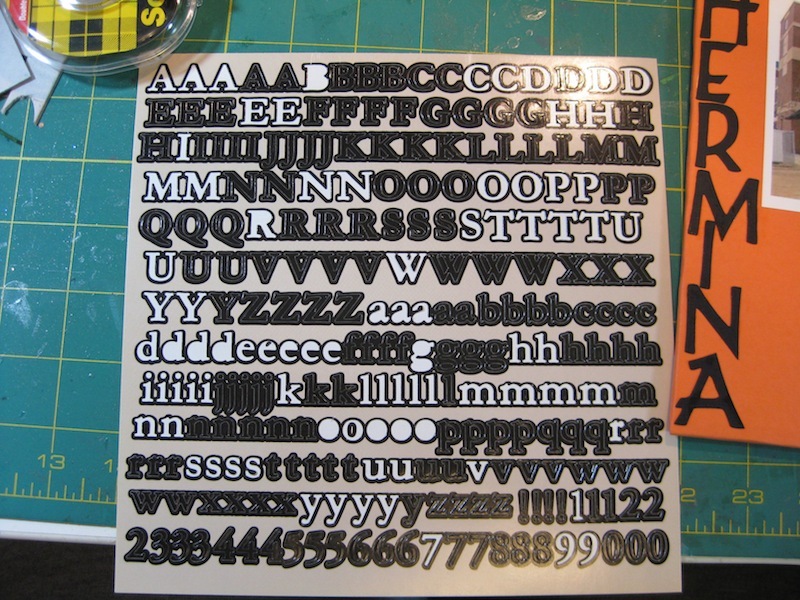 Searching through my abundant supply of letter stickers to find the right size for this project I found this really, really old set of stickers. No “T” 😦 There is, however, a black outline from where a “T” was. BUT to only have one negative letter was not going to be good. I have one of the original Cricut machines. The smallest it will go down is 1″ which I’ve used on the letters of the person’s name for this Holder. 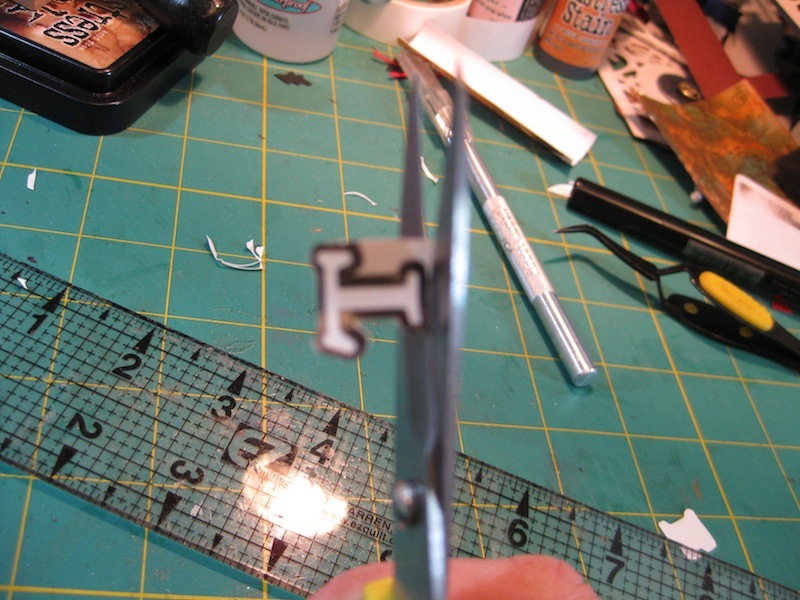 I have not played with my Cricut much so I really don’t know all that it is capable of….other than cutting out letters. I need to get into my room and get it cleaned out today. I have some black rhinestones I need to find in that flaming mess so I can attach one to the “U” where the unsightly space is. Speaking of letters, I dug further in my stash for the lettering around the cover. 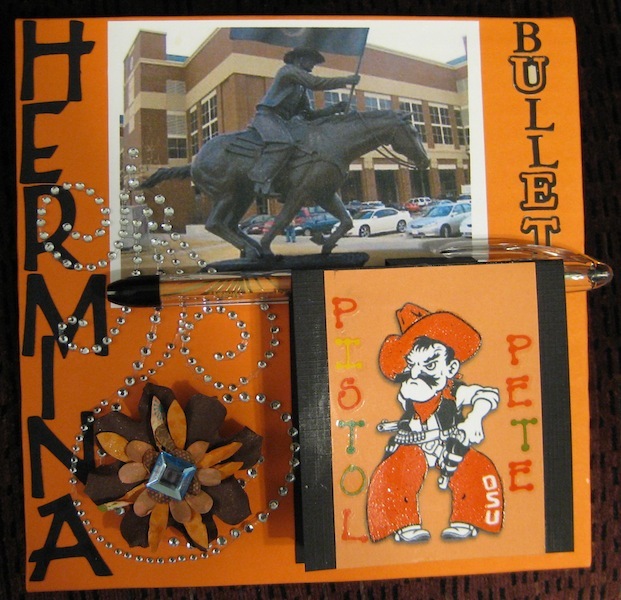 Both images…Pistol Pete and the Spirit Rider on Bullet….are from the internet and printed on Whisper White card stock. Should you decide to print a photo on card stock and wish to have the image not fade over time there is a product that is good for this. 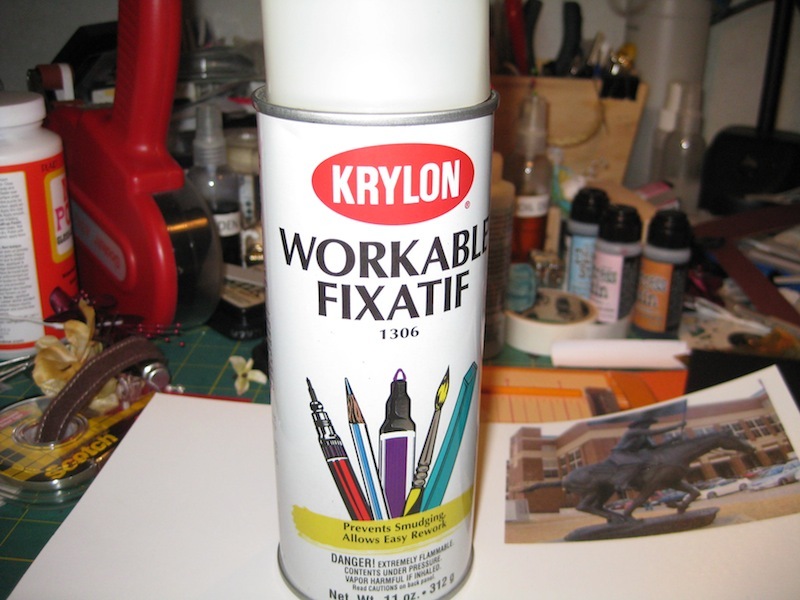 Krylon‘s “Workable Fixitif” is the best stuff to use. This is NOT RECOMMENDED for use in scrapbooks because of the chemicals in this product. If you draw with chalks this stuff is the best. It will keep the work you have already done from smearing as your hand moves around the paper as you draw. You can still go back to an area already worked with no fear of having a slick surface with no chalk adhesion. When you first spray this over a photo on card stock the photo will change and get darker. Don’t worry, let it set for about 20 minutes. It will dry clear and your photo will look as it did before you sprayed it. Also, take this outside!! Spray this pungent stuff outside. Do several passes about 5 inches from the surface of what you are spraying. Don’t linger in a spot too long or it will cause the colors to bleed and run. Not good 😦 Coat the entire image and surrounding paper you will be working with. I have a treacherous path into my room. 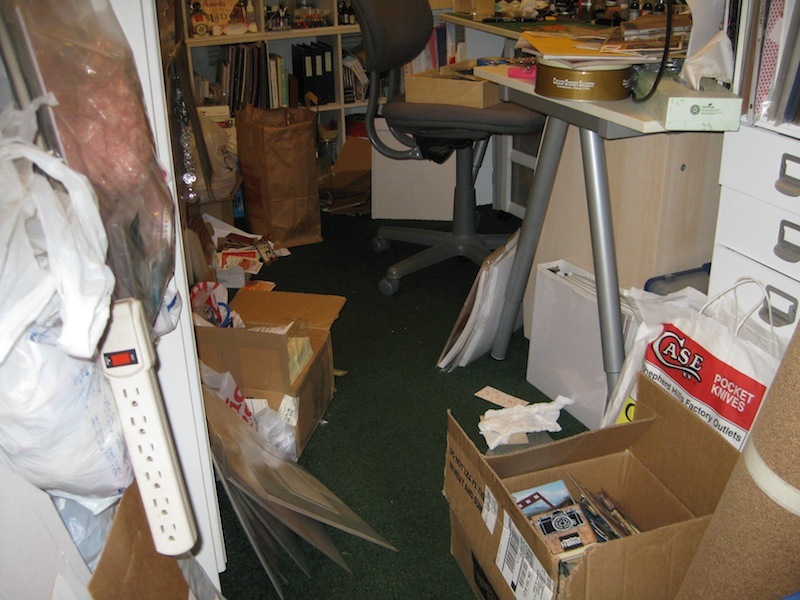 This space is beginning to look, and feel, as though it should be featured on one of those “Hoarder” shows. I have two bases being pressed right now. They will not be workable until later this afternoon so it is time to get in this room for some purging, cleaning, and reorganizing. Have fun cleaning! I like putting things where they belong! Then when everything is put away, you’ll have a good idea if any of the storage spaces need to be “repurposed” for something else that fits it better. That DOES NOT MEAN GOING TO THE STORE FOR MORE STORAGE CONTAINERS, though! Kelley actually suggested that maybe it was time to PURGE some of my supplies when we were making space for her in her room. I don’t believe my personal dictionary even has a LISTING for that word – have you ever heard of it, because I HAVE NOT!!! Love the way you think outside of the box. I have this thing called Packratism 🙂 Yup pack as much stuff as I can in this already stuffed space, well Brian would say that at least lol. I’ve not heard of the krylon spray ,I was told to spray cheap aerosol hairspray on the chalked images but even then it’s much better to in a well ventilated area. I will have to check this stuff out. Hope all goes well with the craft room clean up. Will be looking foward to seeing your progress. Join the “Packratism” League 😀 Nearly everything I see anymore I think how it can be used on some project. Plastic lobster bibs, restaurant menu that looks like an old newspaper. Aerosol hair spray works pretty good. The only problem is the “sticky” factor. Any moisture, even years later, is attracted to the hair spray. The Krylon stuff doesn’t not attract moisture so the piece won’t get sticky in a humid area. Just think of all the things you will find Leslie that you forgot about since you last cleaned and tidied your craft area. I think I enjoy the time I spend rearranging my craft stuff – perhaps I need to get out more 🙂 I shal be glad when I have the space to have all my craft stores out and around me instead of having to keep ferretting around hunting for items that have been stored and then having to put it all away again when I’ve finished. Using the negative of the letters is good…necessity is the mother of invention! Your day for wallowing around in a messy craft room will come. Except I don’t think your room will get messy since you’ve trained yourself to put things back after you are done with them. THAT is a good habit to have and I’m going to set that as my next goal 😀 Be respectful of my craft room and my products.